Somehow it always seems to rain for the Wayfarer's annual sausage sizzle and this year looked like it was going to be no exception. 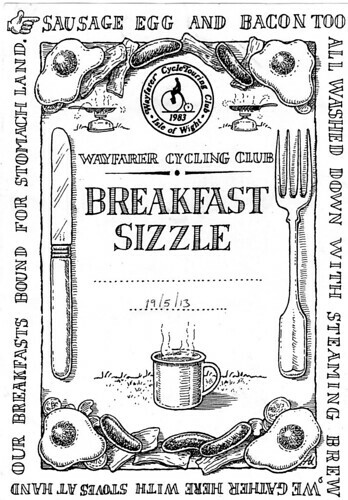 Sizzle in the drizzle seemed to be on the cards as I cycled to the meeting place at Merstone where six of the usual stoving suspects were gathered. We were soon joined by Dave whose tiny saddle pack confirmed that he hadn't read the runs list and was condemned to spend the morning hungrily watching the rest of us stuff our faces. I suppose we could have offered him a sausage! Next to arrive was Tim, a stoving virgin. He was a bit worried about the gas stove that he had found in the dark recesses of his shed. He could definitely remember using it for a camping trip in 1974! According to the runs list the actual sizzle was to take place at Niton but as there is no shelter there we didn't really fancy that idea. It seemed unlikely that anyone else would turn up so we decided to go for a little ride to build up an appetite then return to Merstone where we could shelter under the old railway bridge. As it turned out it had stopped raining by the time we returned so we opted for a much pleasanter location on the picnic benches there. I'd had a small breakfast before setting out but I was now feeling quite hungry enough to do justice to a large fry up. Somehow food always tastes better outside and a large mug of tea never fails to hit the spot. Suitably replete we headed off for the 11.00 am tea stop at Niton – its hard work this cycling! On arrival we were rather surprised to be greeted by 4 rather disgruntled would-be sizzlers. First rule of stoving – if you are not going to be at the start let the runs leader know you are coming, there is no guarantee that runs will go where they say they will! They seemed to have managed quite well without us but were now heading for the cafe. Each to his own. We got the stoves out again for yet more tea. You can't have too much tea! 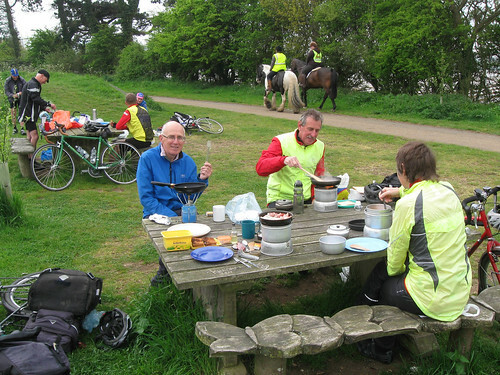 We didn't cycle many miles, in fact I think we spent more time eating than cycling, but we had a lot of fun. We even got a certificate for our 'efforts'! Posted by Hilary on May 24th, 2013. I'm not sure I've ever come across the equivalent of the Wayfarer Sausage Sizzlers in my part of the world. In fact, the tendency seems to be to go even lighter. Our group yesterday used three café stops (I didn't bother with the last one as I wanted to be home as close to four o'clock as possible), although some did bring their own grub as well. "Sizzle in the drizzle" ... very nice. There's some mean looking kit there. Mary would definitely approve – she never rides without at least two days' food supply :). The tendency to go light (or not) brings to mind an excellent book I'm reading about the British invasion of Afghanistan in 1840 (Return of a KIng, William Dalrymple). One regiment need three camels just to transport its supply of finest vintage cigars. No carbon fiber frames for them! 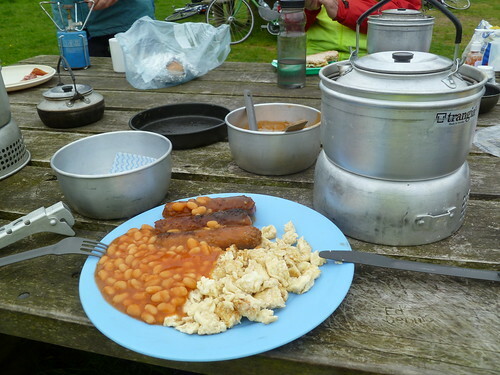 That plate of yours looks just like your fine veggie breakfast at the sizzling Olympics and 2010's soggy sausage sizzle! I might read that book some time Kern. Military history, though often depressing, is one of my subjects. Matériel for my Kindle I think. Stovers are in a minority, most people seem to prefer to go to the cafe but I much prefer to stay outside. I started sizzling in the Guides when I was ten and am very happy to continue the tradition. Of course we used open fires then, perhaps we should try that again sometime..........!